A bottlenose dolphin rehabilitated at Mote Marine Laboratory since Halloween 2018 was returned to the ocean today, Jan. 28, nearly 2 miles off north Anna Maria Island, Florida, after Mote staff and volunteers dedicated more than 6,000 hours to her recovery. 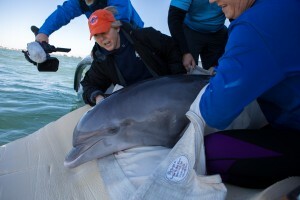 “Salem,” an adult female bottlenose dolphin, originally stranded near the Sunshine Skyway Bridge and was rescued by Florida Fish and Wildlife Conservation Commission staff, who transported her to Jane’s Refuge: The Hospital for Dolphins and Whales at Mote Marine Laboratory. Since arrival, Salem has received 24-hour care that allowed her to recover from conditions including a severe infection, gastritis (stomach inflammation), a deep shark bite wound, anemia and low body weight. Diagnostic tests ruled out brevetoxicosis (red tide poisoning) and other issues. While no single cause of stranding was pinpointed, one thing is clear: Salem arrived in critical condition and returned to the wild looking and behaving like a healthy wild dolphin. She gained 127 pounds (58 kilograms) of weight between arrival and release, consuming 2,042 pounds of fish. Antibiotics helped Salem recover from infections and iron supplementation improved her red blood cell count. The water level in her medical pool was increased as Salem grew stronger, and her water temperature was decreased to prepare her for return to the wild. She was given “environmental enrichment devices,” toys designed to provide healthy mental and physical stimulation. In December, she passed a hearing test — a requirement for release because dolphins need their hearing to hunt, navigate and socialize. Her bloodwork and weight continued improving, and in late January, federal wildlife officials with NOAA Fisheries declared Salem ready for release. “Salem had around-the-clock care from the moment she arrived until release, which was happily provided by a dedicated team of staff and volunteers,” said Lynne Byrd, Medical Care and Rehabilitation Coordinator. This afternoon, Mote caregivers used a crane to lift Salem from her hospital pool and transported her to the Lab’s fastest research vessel, the William R. Mote, named after the Lab’s major benefactor and donated by Yellowfin Yachts owner Wylie Nagler. The vessel includes oversized dive doors that facilitate working with large marine animals such as Salem. Within an hour the team reached the release site, which is well outside the bounds of the patchy red tide that lingers off some parts of southwest Florida. "The release was awesome," Byrd said. "We observed her within the first minute she was in the water, and we saw her several more times in the next 15 minutes. 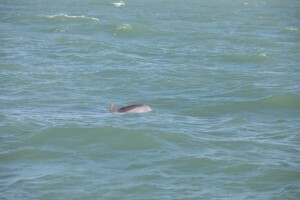 We also saw other dolphins out there." Aboard the vessel, scientists with Mote and the Sarasota Dolphin Research Program (SDRP, a Chicago Zoological Society Program in collaboration with Mote) fitted Salem with a satellite-linked tag to monitor her location and dive patterns for up to several months after release. The SDRP will provide updates to Mote and NOAA Fisheries, so Mote can share Salem’s journey with the public. “The satellite-linked tag provided through NOAA Fisheries support will allow us to closely monitor her behavior even if she moves too far offshore for our vessels to check up on her directly. We expect to obtain several locations each day, along with information on how deep and how long she is diving — key parameters for assessing her re-adaptation to life in the wild,” said Dr. Randall Wells, Director of the SDRP. While Mote’s hospital team is thrilled to return Salem to the wild, they must remain prepared at all times for the next dolphin or sea turtle patient that needs critical care — that means having medicines, food, facilities and veterinary instruments available at all times. This important service depends on philanthropic donations to Mote, an independent, nonprofit marine science institution. Critical care for just one dolphin costs thousands of dollars per day. Please help: Visit https://mote.org/support and choose "Marine animal rescue and rehabilitation” from the drop-down menu.